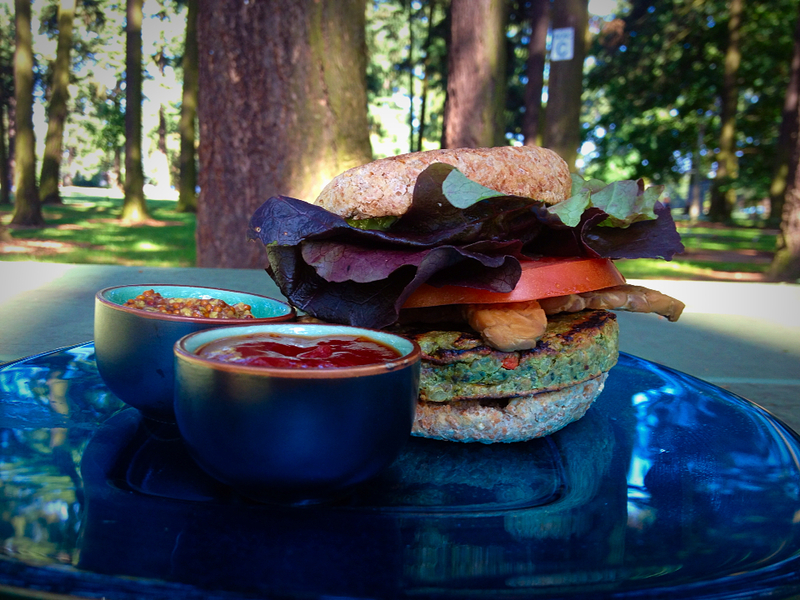 Guest blog post by Tasha, vegan blogger at Tasha’s Dish. Summer is here and it is time to break out the grill and have a summer barbecue. Nothing goes better with barbecued burgers like potato salad. 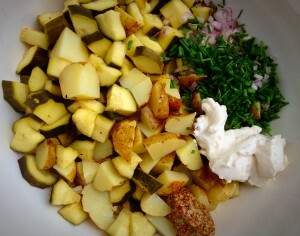 This time of year, new potatoes and zucchini are easy finds at the farmer’s market. This potato salad focuses on the in-season waxy early potatoes and zucchini, with Vegenaise, mustard, shallots, and chives tying all of the flavors together. The potato salad makes a perfect side dish to the TLT (Tempeh Lettuce and Tomato) Burger, which is a vegan replica of its meatier counterpart. This meal is quintessential outdoor barbeque fare so enjoy with friends and a side of lovely weather! First, combine the Vegenaise and vegan pesto in a small bowl using a fork or a whisk. Once fully combined, spread the pesto aioli on one side of each English Muffin. 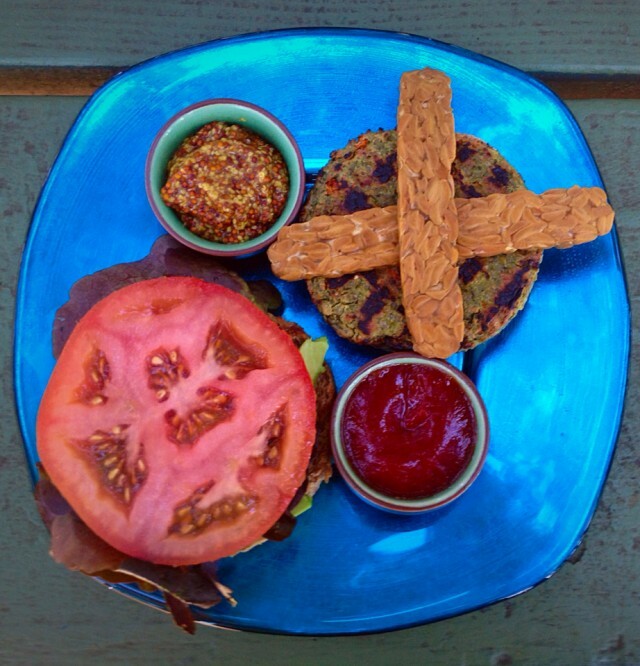 Top with the Sunshine Burger and 2 tempeh strips. Top the other side of the English Muffin with avocado slices, lettuce, and tomato. Repeat this process for each burger. First, make the quick zucchini pickles. In a heavy bottomed pan combine vinegar, sugar, salt, garlic, and peppers. Bring ingredients to a boil, then add the zucchini. After adding the zucchini immediately remove the pan from the heat. Set aside and let the mixture cool until it is safe to handle. Cover the new potatoes with olive oil, garlic, and salt then transfer to an oven safe pan. Bake potatoes on 375 degrees F until a fork easily slides through the largest potato (about 30 minutes). Remove the potatoes from the oven and let cool until easy to handle. 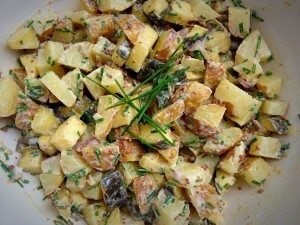 When easy to handle, chop the cooked potatoes into chunks and transfer to a large mixing bowl. When the zucchini have cooled enough to handle, strain the zucchini from the brine and add them to the bowl with the potatoes. Add Vegenaise, shallot, mustard, and chives to the bowl, and mix with a spoon until all ingredients are combined. You can serve this salad slightly warm (with the pickles and potatoes still warm from cooking) or chill in the fridge and serve cold. 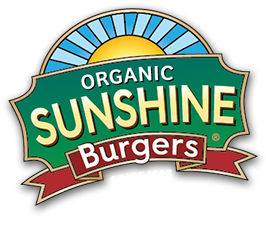 Serve with TLT Sunshine Burgers!